Processing: Images were captured Artemis Capture (as FITs). Aligned/stacked and dark subtracted in Astroart with Sigma Combine and Average Combine. The Average and Sigma Combine stacks were blended to optimize noise and reduce a few satellite tracks. Luminance and Color channels were scaled and rough color balanced in Astroart. All combined stacks were up-sampled to 1392x1040 (1x1 bin resolution). Central Gradient was removed on all channels in Astroart. Channels were co-registered in Astroart. The 7 minute IR block exposures were used for the main luminance construction with level adjustments and curves to bring out object features. LRGB combine was done in Photoshop. Background noise reduction was done with PixInsight LE (SGBNR). Selective sharpening was applied to galaxy features. Final Image size is approximately 1392x1040. This image was guided; North is up. 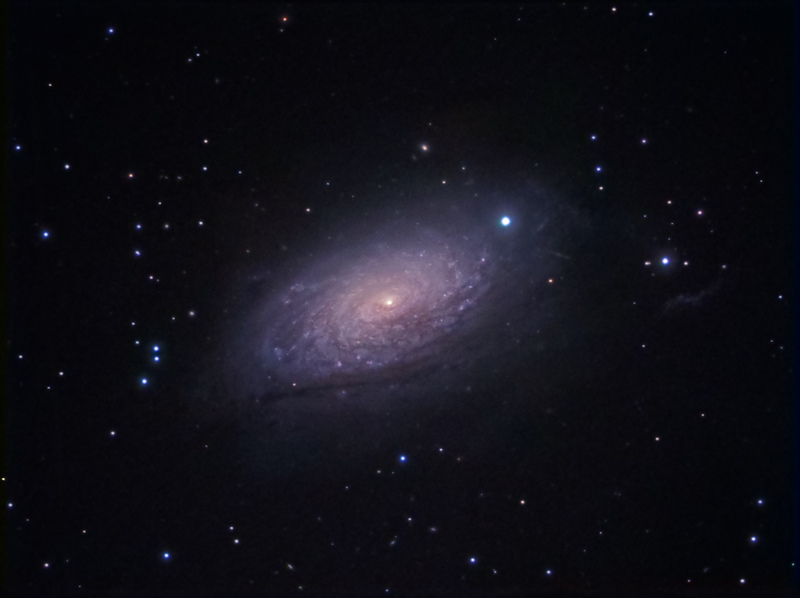 The Sunflower Galaxy, M63 is in the constellation of Canes Venatici. M63 is in the M51 group as is the well known M51 galaxy - also in Canes Venatici. Also visible in this image toward the right edge is a small apparent cloud - it is an irregular galaxy with a Principal Galaxies Catalog identification of PGC 46093. There are two interesting galaxies toward the right periphery of M63 (just right of the bright star HD 115270) as well as several galaxies in the lower part of the image. M63 is estimated at about 37 million light years distant from Earth. This image replaces an earlier image that can be seen in the Archives here . Horizontal FOV is 23'. Image Center is approximately - Equatorial 2000: RA: 13h 15m 49s Dec: +42°02'06"